I saw this quote today and It reminded me of this past year and going forward into the new year. I look back on this past year and I want to run from it! I want to run and not look back; run far far away! I also look forward into the new year and I want to slow down in fear of not knowing what is ahead – but this quote is a reminder that I don’t have to run nor do I need to fear what is front of me. 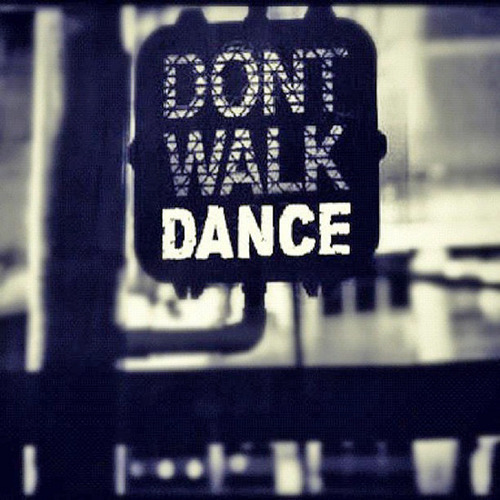 Don’t walk, Dance! Christmas Eve night I was sitting with my husband after we opened all the gifts and as I sat on the couch with him, I said to him “do you realize that it’s been exactly ONE year today that I began isolating from all the things and people I love?” and my husband looked at me with love and care knowing the hard year I endured. I stopped sleeping in my own bed, stopped going to church, stopped spending time with the people I love. I started pushing people away and changed my routines. I even cut my hair last January in hopes it would change me enough to change all that had happened the year before. I started sleeping on the couch because of the triggers that the past 2 years has brought to me. The only place I would show up and work hard was in therapy because at least in therapy working with my therapist there was hope that something would change so much I would move out of the trigger and isolation. My therapist and I worked so incredibly hard this year. There were times I even tried pushing him way – but he never gave up on me, nor did he let me give up on him! We both kept showing up and creating as much connection and goodness as we could to move out and towards the good path waiting for me. Waiting for the “dance” – and we fought for it and I am so glad we did. As I sit here today writing this, in this very moment, I am no longer looking back, but looking right here in this moment. I have finally moved out of the isolation I put myself in this past year ..it’s slow, but it’s movement forward. I am starting to embrace support and friends again. I began getting together with friends and my hair is long and all grown back in. I am coming back into the church (it’s a work in progress but I am back). I feel like a part of me is coming back to life again. The work in therapy has been the best its been in years. I feel connected and close to my therapist again. We have worked so hard for this, and I am so glad that I kept pushing forward! I see the path in front of me a lot clearer than this past year; a path worth dancing on! Last week in therapy before Christmas break we had the best talk we have had in over a year and it felt good; like I was back home on the dancing path back to my healing. Trusting, connecting, goodness and grace . all of it! I looked around the room and it felt familiar like once before – like nothing had changed and it felt good and right. Like I wanted to be there. I can’t say I am not scared about what is ahead in my healing and I know there are a lot of wounds to heal – but like my therapist said “this is the good work we do”. I am so looking forward to the year ahead! I want to sit with my husband on the couch next Christmas Eve and say “can you believe the great year we had, look how far I have come” … that is my hope anyways. There are so many things I abandoned this past year; so many things that meant so much to me… but that is about to change. I don’t have to look back on the year, or fear what is forward .. I can be here right now in this very moment. I have the most amazing support, friends, family, therapist and healing path – I just need to accept it, embrace it, work with it, fight for it .. all of it! Like the quote says “Don’t Walk – DANCE”! I am ready to dance! no matter what stands in the way. Starting to move forward out of isolation is good when you have all the support you have. You can take your time. I like to remember that there are some valuable things about isolating, even though the overall thing is not so good because it keeps me from growing and connecting…But I can keep the valuable aspects of isolating. I know that part of isolating is an urge to protect myself and soothe myself. That is really good. For me the next thing is learning how to soothe and take care of myself WHILE I’m in connection with others. And that is a slow process for me. Something I’ve been wondering…how is your husband involved in your healing and growth work? Are there ‘We” things that you and he work on together? Or maybe that is too personal or beyond the scope of your blog. If so, that is fine. I just thought I’d let you know what I was wondering. Thanks again for sharing your wonderful journey of healing. Hey Gel …. Thank you as always … for being here and walking this journey with me. My husband is not a part of my healing in a way that is close like my therapy.. he knows about my story, but he doesn’t know details. He is very loving and supportive of what I go through every day emotionally as my husband, but he doesn’t know the details of my past as much as my therapist does. Tim has come to therapy with me before but it was more so around what was going on with the blog issue and he was very very supportive around that.. but when it comes to my past, I would rather not let him in, because we have such a great marriage of 22 years and it doesn’t effect my marriage and never has.. I would rather keep it that way. BUT he is a wonderful husband and when he see’s me going through a hard time, he knows how to be supportive in a whole without knowing what it is I am going through. We are good that way. Sending happy smiles, warm sun and fluffy white clouds….brightly colored rainbows…..